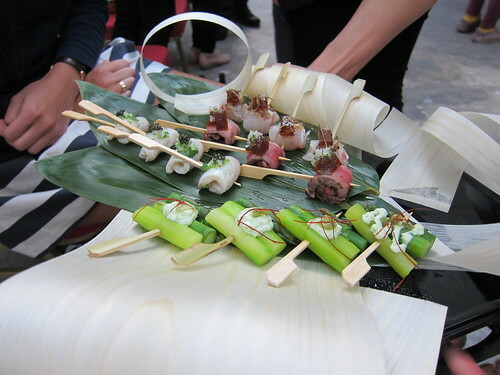 a rather unusual chinaman: Popping up: The Yashin Yatai and the Dinings "Secret Menu"
Popping up: The Yashin Yatai and the Dinings "Secret Menu"
The Summer of 2011 seems to be the summer of the popup. All over the city, we have people "popping up", providing what the public never knew they needed, albeit in short stints. From lobster rolls and good old American barbecue, to cocktails on the roof of a car park to green lakes, they are all there as long as you look for them. I'm a big fan of this kind of experience, it keeps things interesting, and interesting is definitely what I got from two recent Japanese themed outings. 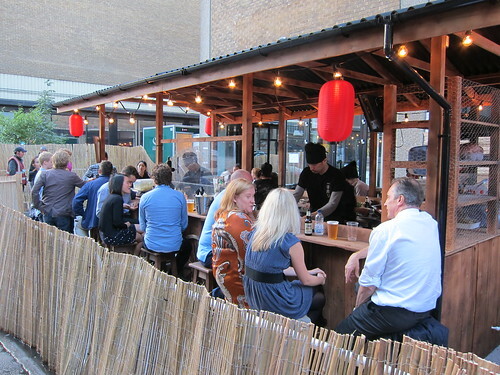 The Kirin Yatai was a 5 day only affair, selling "kushiage" in the heart of Brick lane. 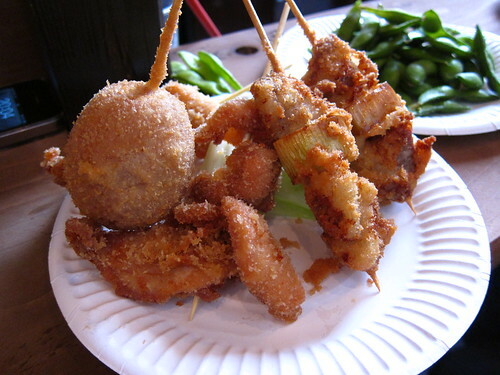 For the uninitiated, Kushiage is Japanese street food, embracing the art of breading and then deep frying, what's not to like? Run by the guys behind Yashin (a well respected sushi restaurant in Kensington), I was hoping for some excellent deep frying and thankfully, that's exactly what I got. For £15, I got a choice of a total of 9 skewers, a bowl of edamame and of course, a crisp bottle of Kirin. With a total of 9 different choices on the menu and 5 different sauces, I went for a combination, doubling up on some of the meatier skewers and avoiding the tofu, tomato and radish options. As we sat by the main yatai (the generic name for Japanese stall selling hot food, according to wikipedia), we watched as each carefully skewered piece of meat was prepared and gently lowered into the vats of bubbling oil. 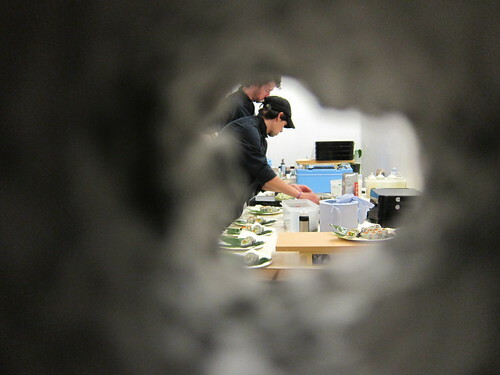 When I got to into tuck into my selection, I was surprised how each individual piece was so perfectly well cooked. Each meaty skewer still juicy, each veggie skewer still maintaining a little crunch and the deep fried egg I had ordered, well, that was just a little weird and probably not the best decision I had ever made. Washed down with a Kirin, and sitting outside watching the expert fryers produce greaseless skewers, I pondered why this wasn't a more permanent fixture. Sat where it was just off Brick Lane, in amongst all the bars, I'm sure it would do pretty well. My second outing was a little weirder. 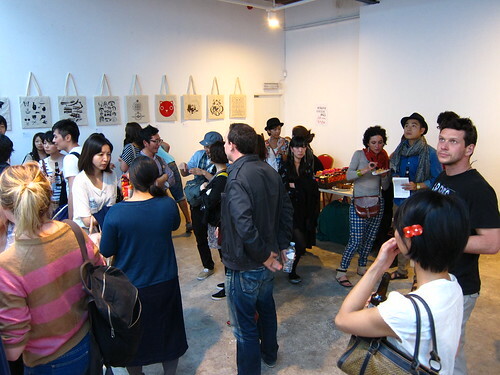 Ichi Ni San (or 123 in Japanese), was a day dedicated to Japan, with films showing in one room (including Godzilla) and cakes and designer tote bags being sold to a thumping beat in the other. I wasn't there for either, as Dinings (another one of these upper class London Japanese restaurants) was hosting a Secret Dinner in a room out the back. For £35, you get entry, all the Asahi you can drink, and a selection of 14 different bites from Dinings. We waited and we waited, but I guess that was part of the fun. Sat in a room filled with the "achingly cool", I surveyed the people around me and that certainly kept me entertained for a while. The highlight was a man with half his head shaved, an artists smock, baggy pantaloons all rounded off by purple leggings. Oh, and facial hair. I spent half an hour alone wondering if I dared ever wear just one of those items of clothing (I decided no). We were eventually allowed into the main room where we started on the all-you-can-drink Asahi and waited for the food. After another little wait, the food started coming out and I must admit, I did feel a little sorry for the guys carting out the trays of what were basically canapés. As soon as they managed a solitary step into the room, they were set upon like a carcass being devoured by a flock of vultures. Ultimately, the raids were worth it. The first round of food was that of the appetisers. Of the four on offer, I think we all enjoyed the combination of wasabi, jalapeno and asparagus the most, although the sea bass, yellow tail and the meaty option of wagyu beef tataki with porcini-ponzu were all also very well received. Of the hot tapas selection, which arrived tepid at best, the sous vide duck with foie gras was the stand out bite. Delicate bits of duck (albeit oddly sitting on what can only be described as a crisp, to add a bit of stability I suppose) and a smear of foie gras to add a bit of richness against the sweet balsamic soy. So good, I probably snaffled about four of these alone. The rest of the selection were also suitably tasty, with grilled Iberian pork with spicy miso and aubergine with a sweet miso packing a flavourful punch. Garlic shrimp tasted like shrimp, nice enough but kind of boring compared to the other morsels. 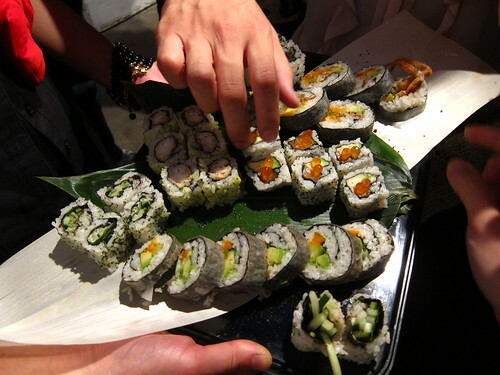 I never realised that canapés could fill me up, but by the time we hit the last rounds of the sushi rolls, I was starting to feel a little bloated. The constant canapé chasing was becoming quite tiresome so we decided to "do one" and split from the carnival which was Dalston. After the initial scepticism, I was full, I had enjoyed the food, and I had managed to have a few beers. A successful day and one I would happily do again. 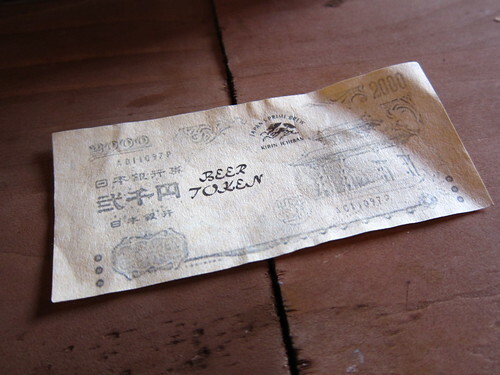 Ichi Ni San and the Dinings "Secret" Menu. Initially I was kinda jealous when I saw that menu but I HATE canape chasing so I'm not so much anymore. Sad I missed my booking at the Kirin pop-up though; bloody riots. @ Lizzie - It was pretty frustrating, but there was plenty of food in the end, and mostly very good. 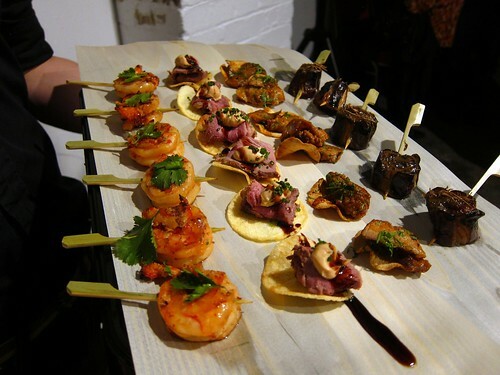 I had a canapé ninja with me, essential for such functions. After reading about the trendys attending I can't help but think of the "Being a dickhead's cool" video. 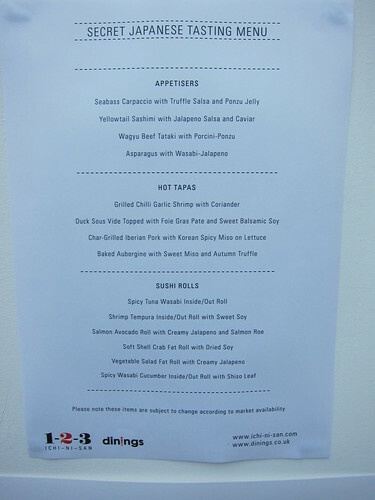 The food at the pop up sounded really truly amazing - I like food that doesn't need to shout about how amazing it is. The other food sounded ok but perhaps a little pretentious, especially as you had to chase around the waiters!